Project Pokémon! 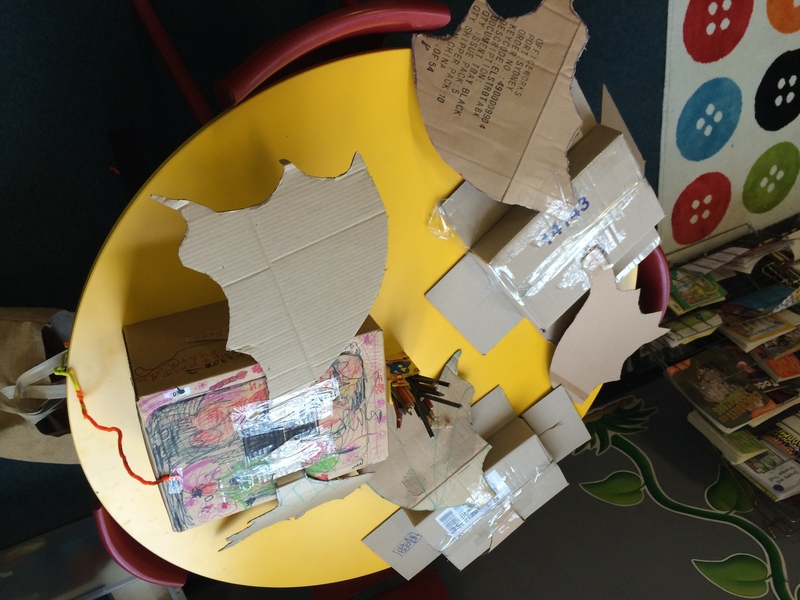 Year 1 #PBL inquiry into Australian insects and Japanese pocket monsters. This week I’m launching my first whole class project with my year 1 class, the @Lionfish1L for 2015. 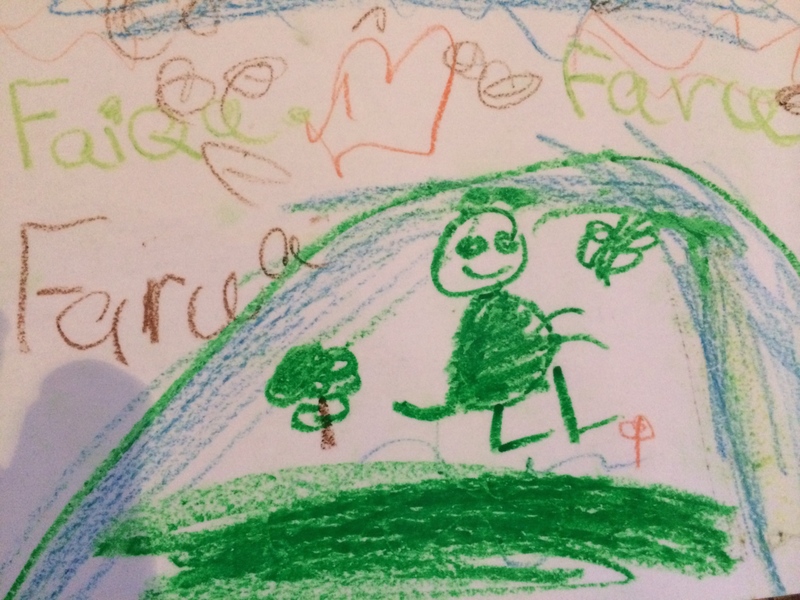 The idea came from a recent trip to the Daintree Rainforest over the summer holidays. 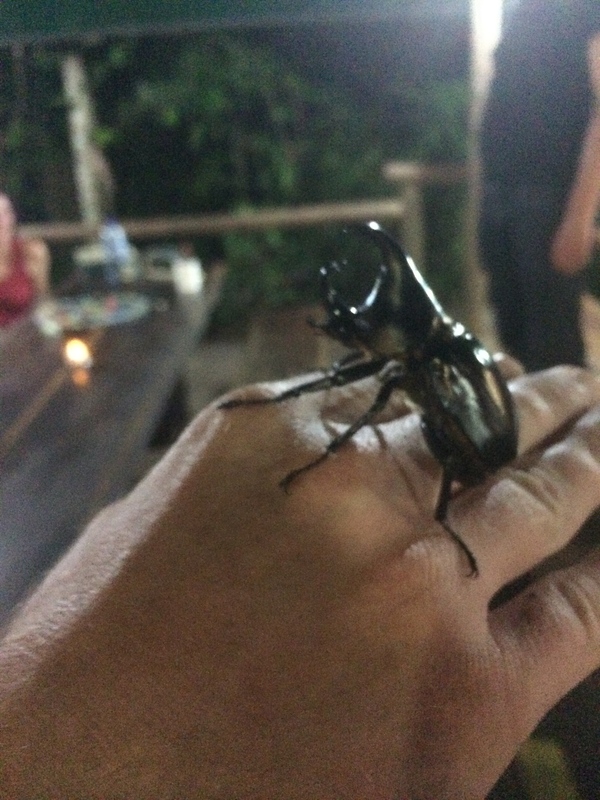 Whilst there, I was lucky enough to see my first ever Rhinoceros Beetle, cruising around the rainforest retreat where we were staying. 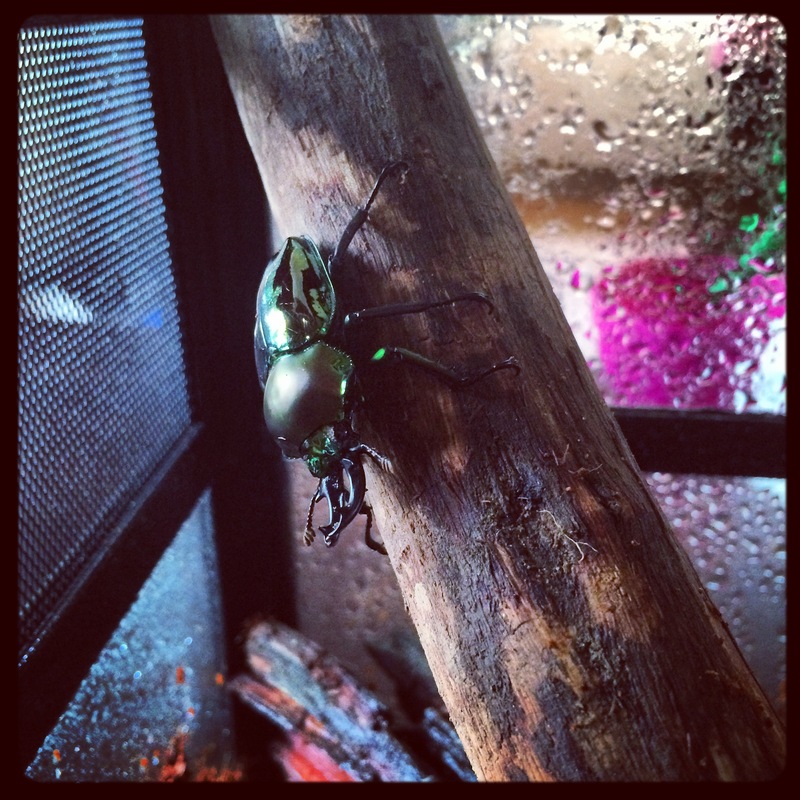 Being a lover of insects and social media, I naturally picked the fine specimen up to take photos for my friends on Instagram. The photos sparked a Twitter conversation between myself, @pipcleaves and @debimoa, both of whom are experienced Japanese teachers. 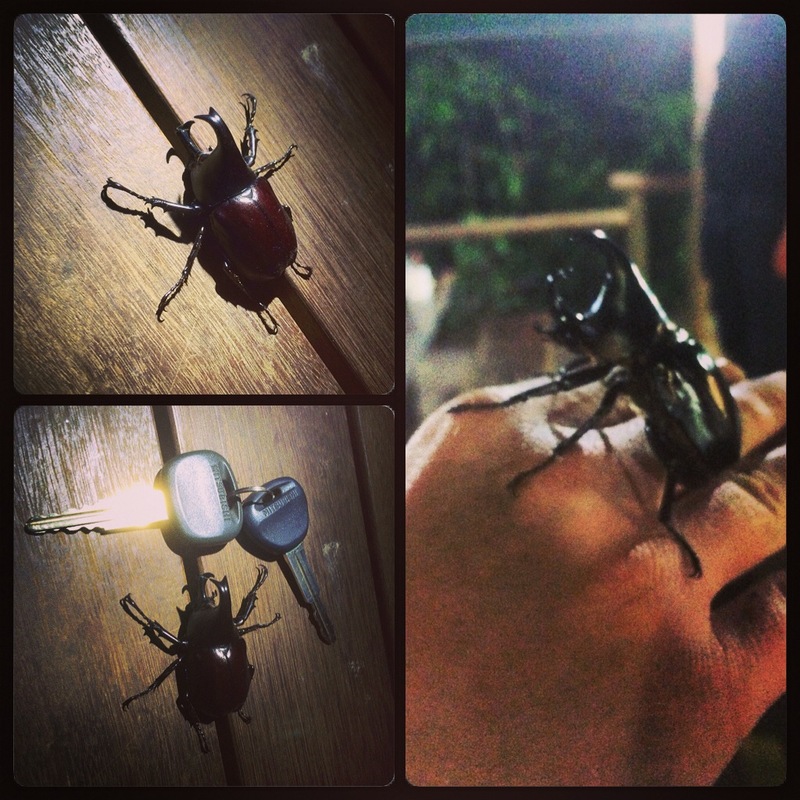 They informed me that Rhino Beetles, known as kabutomushi or helmet-bugs, are popular childhood pets in Japan. Pip said that at one point she and her children had three of them living in their house! 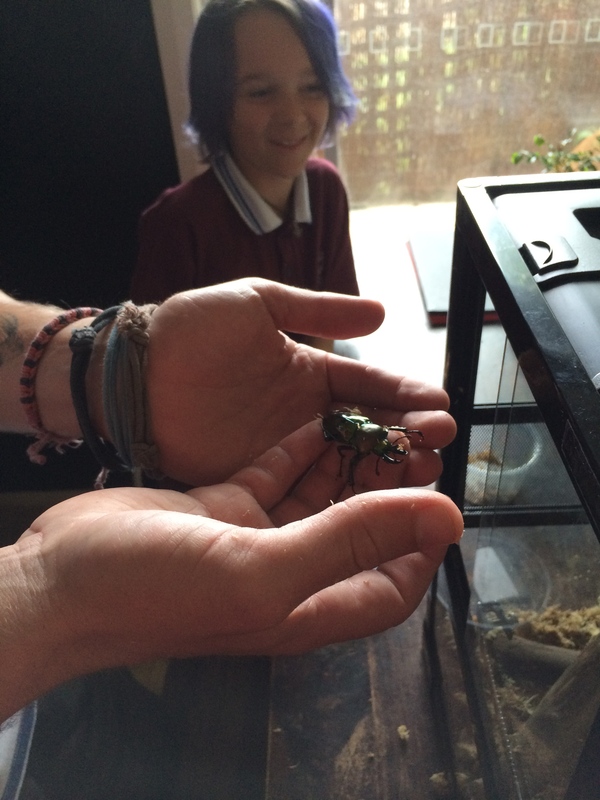 We got to talking about how cool it would be to have one as a class pet and pretty soon we had formed the basis of a class project all around Rhino beetles, Australian insects and Pokémon. 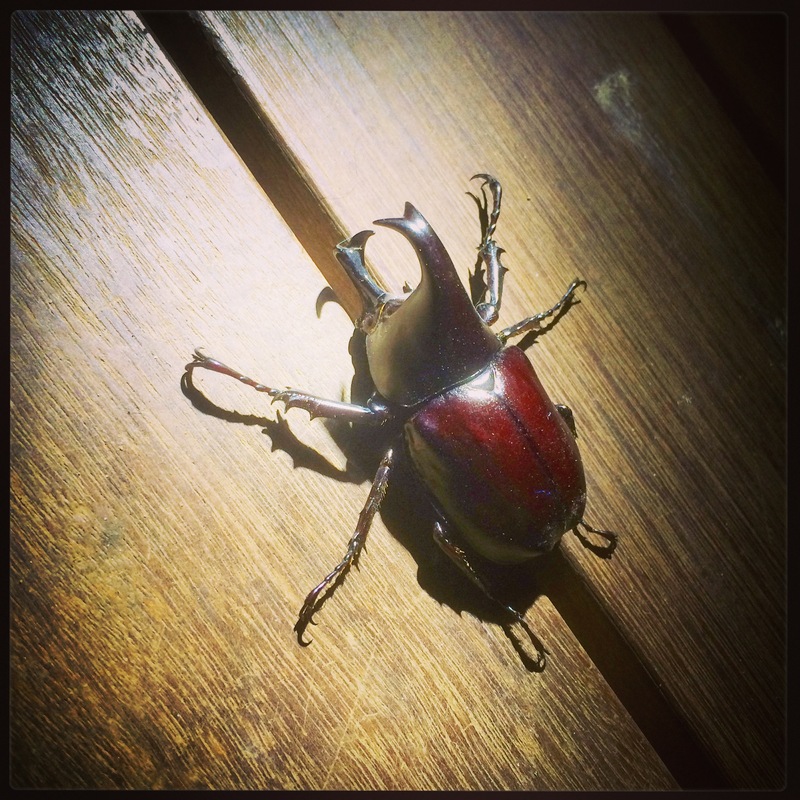 I started looking into where you could buy rhinoceros beetles in Australia and found that they can be quite tricky to source. 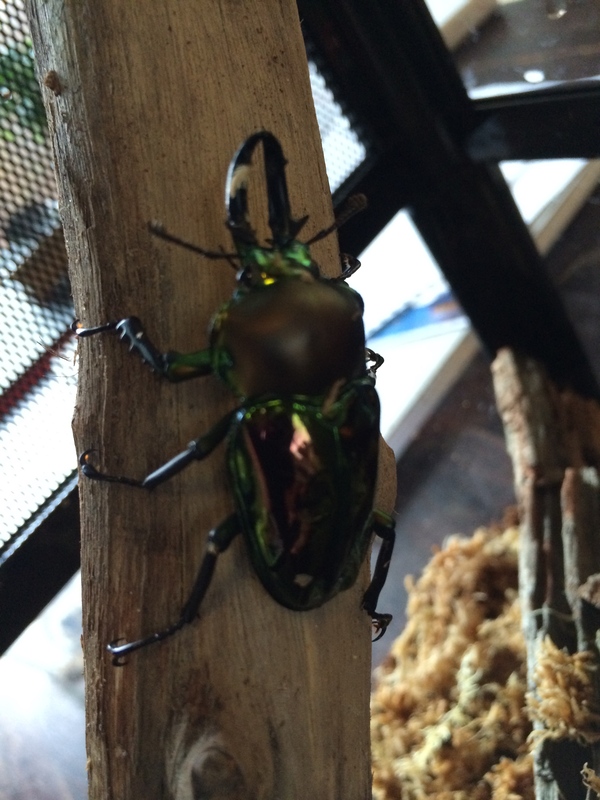 During my research I found a company in North Queensland that sells Rainbow Stag Beetles, a tropical rainforest beetle that’s similar to rhino beetles, only much more spectacular in colour. I’ve set up a terrarium and currently have a lovely specimen living in my home. They really are marvellous creatures, albeit nocturnal and somewhat shy. It’s been a bit of a learning curve trying to keep the terrarium at the right temperature and humidity and figuring out how to get it to eat. The project outline is below. 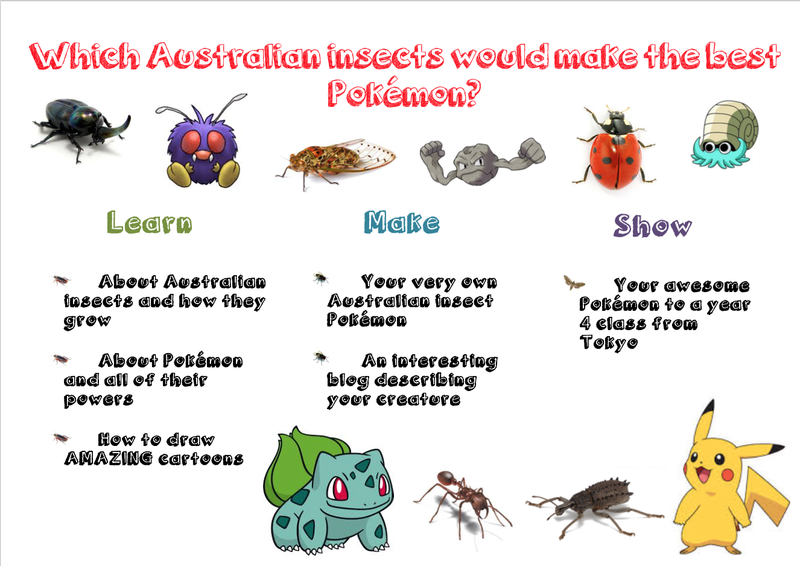 The basic premise is that students learn as much as they can about Australian insects and Pokémon, as well as how to draw cool cartoons. 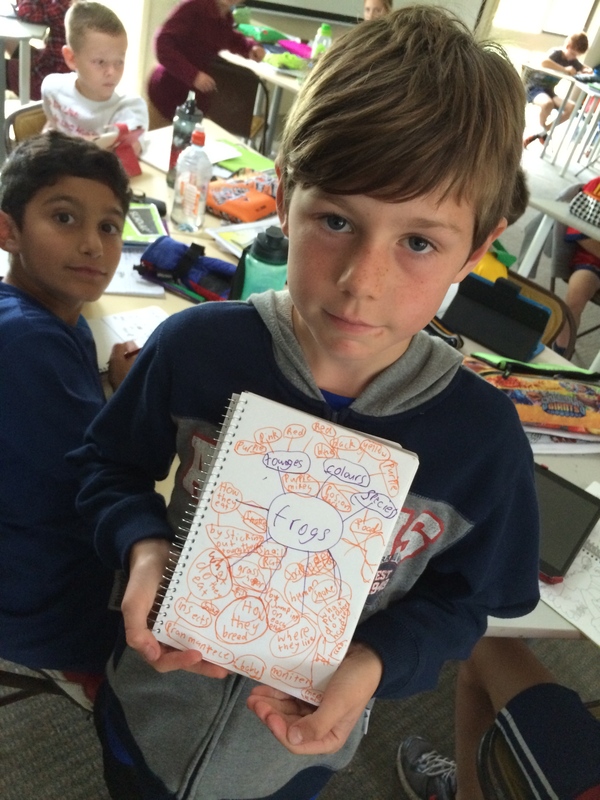 They will then create their own Pokémon based on an Australian insect of their choice, draw some awesome cartoons and put them on a blog to share with a class from Tokyo – I’ve managed to connect with year 4 class, @TISGrade4 on Twitter and they have already studied the project outline with interest! 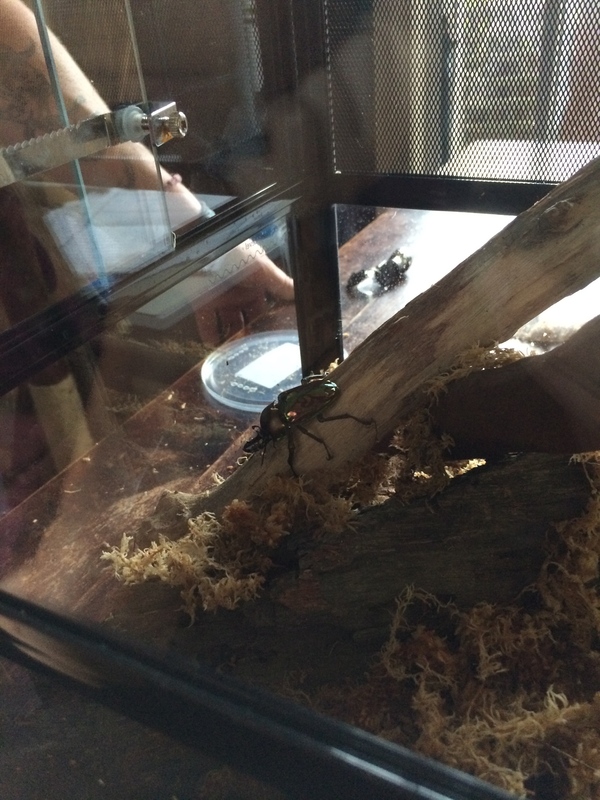 I’m going to launch the project tomorrow by showing my class their new beetle, letting those who are keen to check it out, and getting them to play a flash game on ABC Splash in which you explore an Australian garden searching for insects. Needless to say I’m excited about this project and can’t wait to see what fabulous creations my class come up with over the following weeks! Categories: Uncategorized | Tags: Education, elementary education, learning, PBL, primary, primary education, primary School, primary science, project-based learning, project-learning, Science | Permalink. 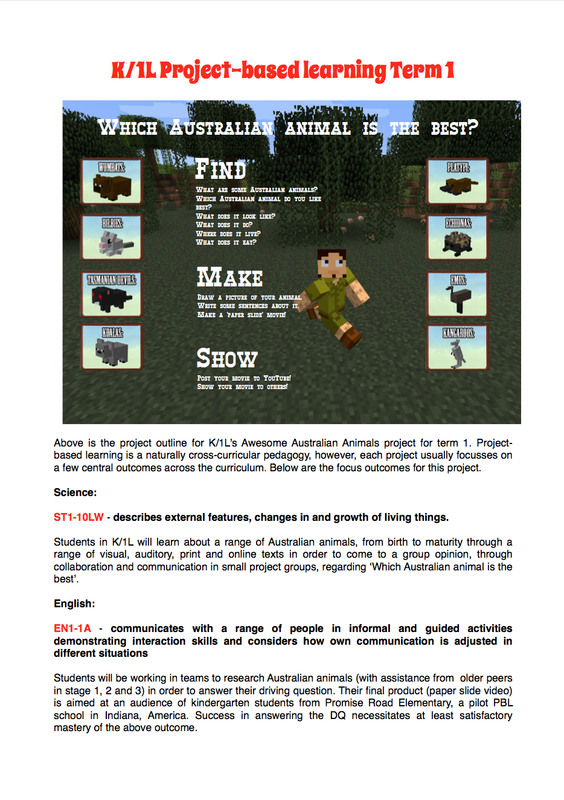 Below I am going to post a .pdf of one of my typical programs for a primary school #PBL project. I’ve been asked to share this before and have previously given this link to Drew Perkins from the BIE, but I thought I’d also post it up here so that I can more readily look back on my awesome in years to come – lulz. You should be able to download the .pdf from the link above the photo, but failing that, you can get it via the link to the google doc here. You will see that up the top, along with the project outline showing the DQ, need to knows, product and audience are a bunch of syllabus outcomes. These are here because, as a responsible teacher, I like to plan with the curriculum in mind. In actuality, not all of this content was explored as well as I would perhaps have liked, but it’s good to aim high! 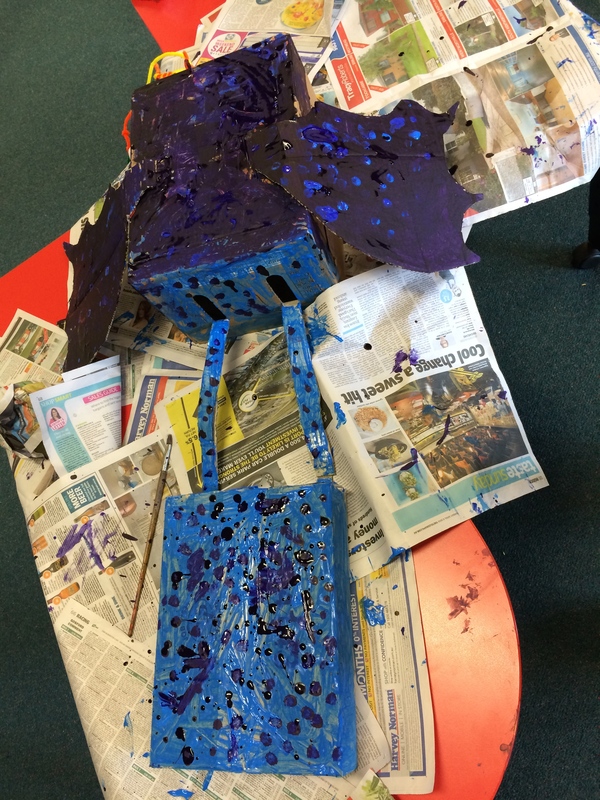 Also, as is always the case with #PBL, there is content that unexpectedly sneaks its way into the project, leaving you surprised and stoked with what has naturally and authentically been ‘covered’, with purpose. I also like to plan for proper project-based learning, so you will see that I have outlined how the 8 essentials will be given the respect and consideration they deserve. 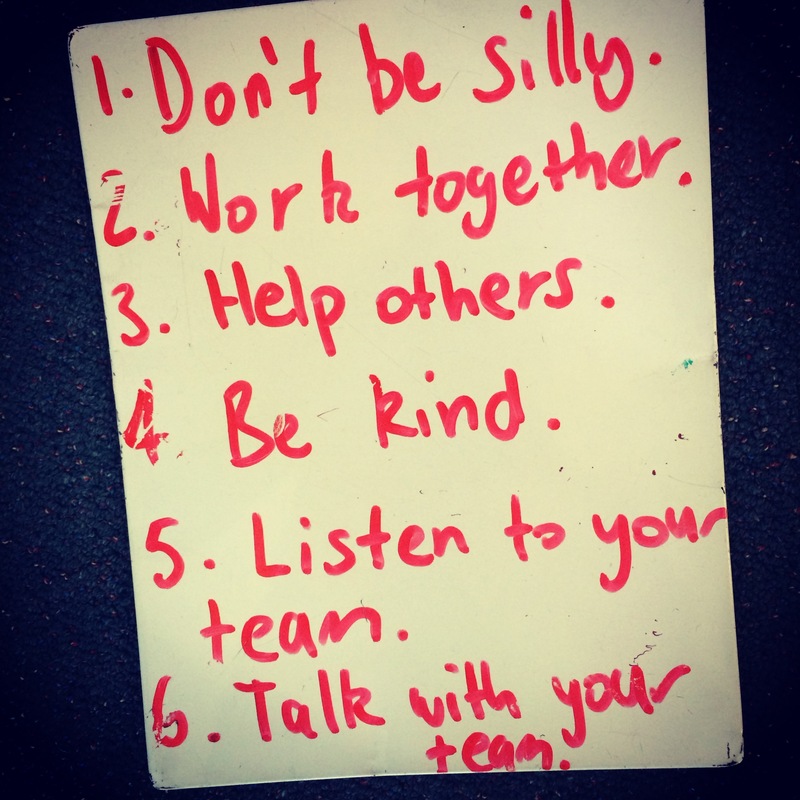 As Bianca and I have said on numerous occasions, if you’re not including ALL of the 8 essentials, you’re not doing PBL. You might be doing elements of, but not the actual ‘thing’, ugh. You will see that I have also attempted to give a weekly run down of what the class is expected to be doing. This is, of course, fairly vague and open ended because project-based learning is considerably less teacher driven and students are expected to have greater ownership over the learning process. If the program had a massive chart of explicit lessons, it would look like a traditional unit of work, not PBL. To give an example of what I’m on about, I’ll briefly explain what’s happening with my current K/1 project which has unexpectedly become bigger than Ben Hur. 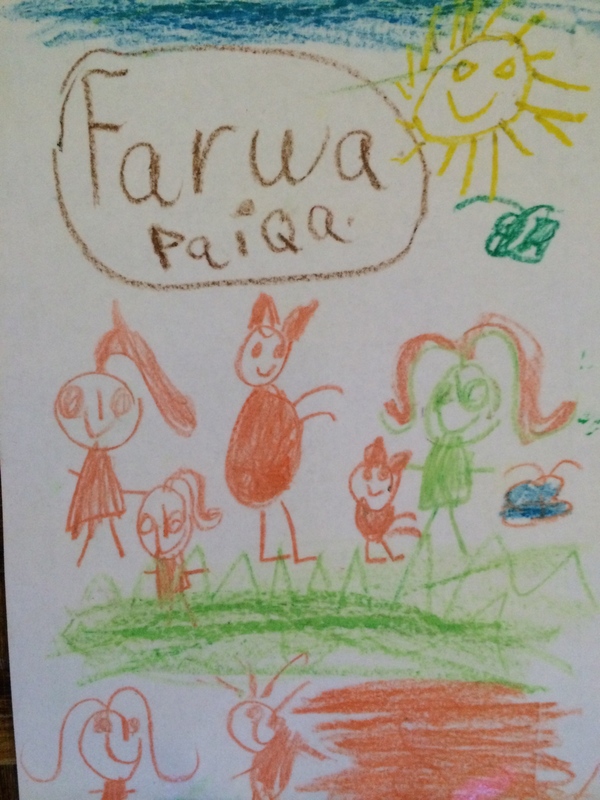 Last term we were working on some imaginative stories for a class of students in Wagga Wagga, NSW. I went overseas, the class over in Wagga were very slow in communications, and the project kinda went downhill. When I returned I started thinking about how I could ‘rescue’ the project and still keep it PBL. I decided to share the stories with Bianca’s year 7 class and we are going to publish them as a compilation of short stories with illustrations made by her class. We’ll be sharing them with our local libraries. As we’ve an assembly item approaching, I thought it would be nice to perform one of the stories for the school. 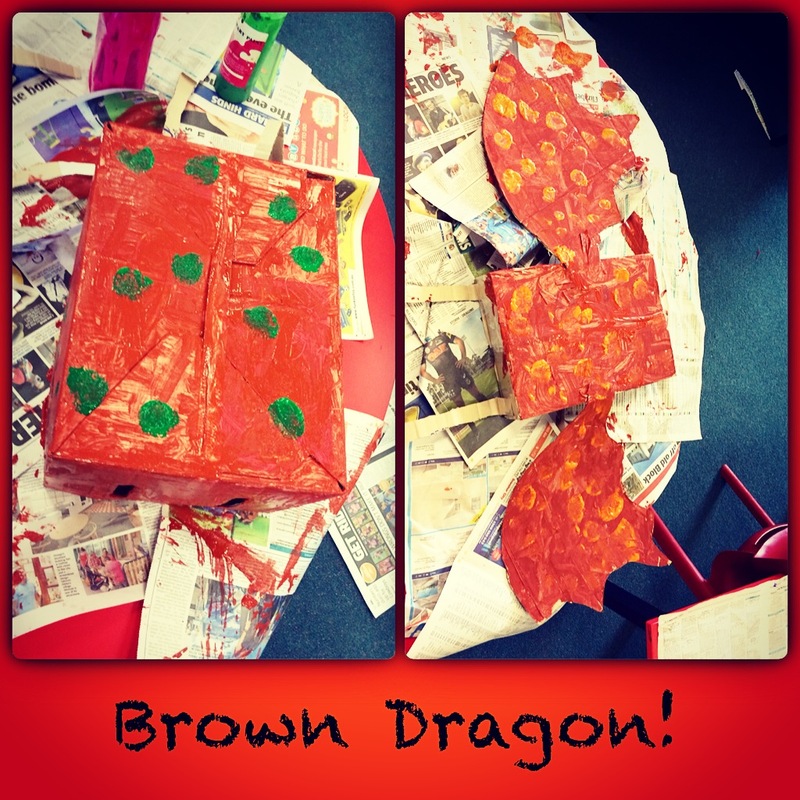 We have chosen our story and started practising and making costumes and props. I have had close to zero creative control over the process of costume and prop creation, aside from making a couple of templates for dragon wings and some of the complex Sellotape engineering required in order to keep them intact. You can see some of the works in progress below. 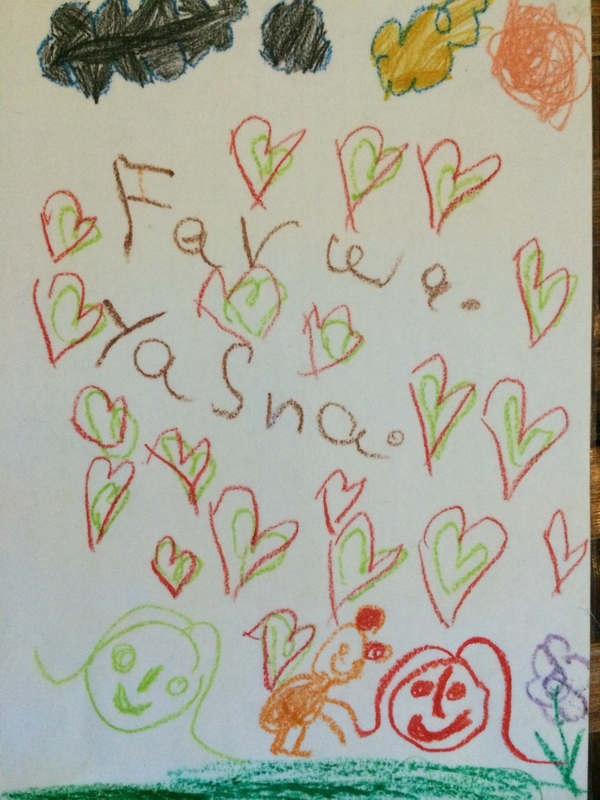 What my little 5 and 6 year old students have done has truly astounded me. Powerful, student-driven #PBL #FTW. No amount of lessons plans could have predicted that this! Categories: Uncategorized | Tags: Education, elementary education, Elementary School, K-2, K-6, learning, PBL, primary education, primary School, project-based learning, project-learning, projects, School, teaching | Permalink. Observation at another PBL school: a kinda ‘out-of-body experience’. Today was a great day. Bianca and I were lucky enough to be asked to visit the International Football School on the Central Coast. The IFS is a recently established independent school with a focus on project-based learning and, as the name suggests, football – and when I say football, I mean the type of football which many of us call soccer. Basically, kids who attend IFS are kids who have demonstrated a strong interest in and talent for soccer and are committed to training every day in the interest of pursuing a career in soccer. 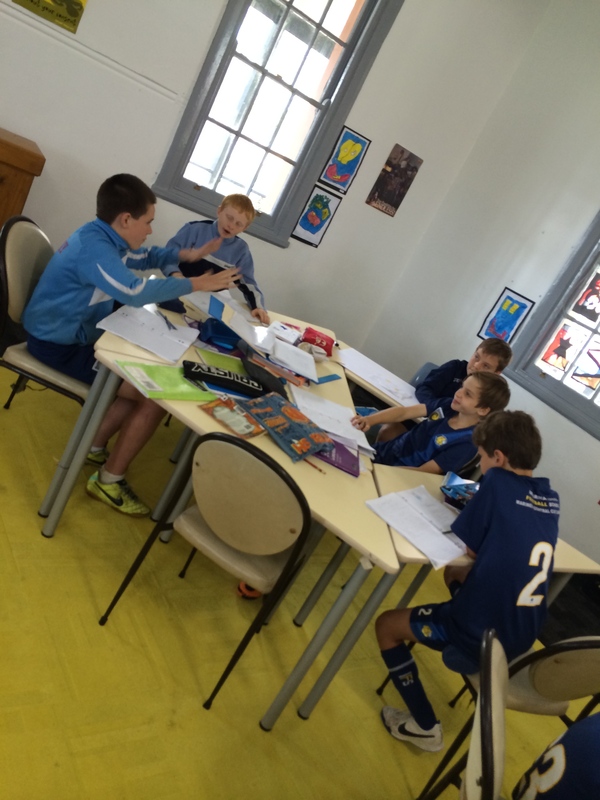 They train for two hours every morning, under the tuition of professional soccer coaches before going to class to learn the NSW syllabuses under a project-based learning pedagogy. Bianca and I were asked to visit the school for the day to share our own approaches to and experiences of project-based learning, before observing classroom practice to give general feedback and suggestions. 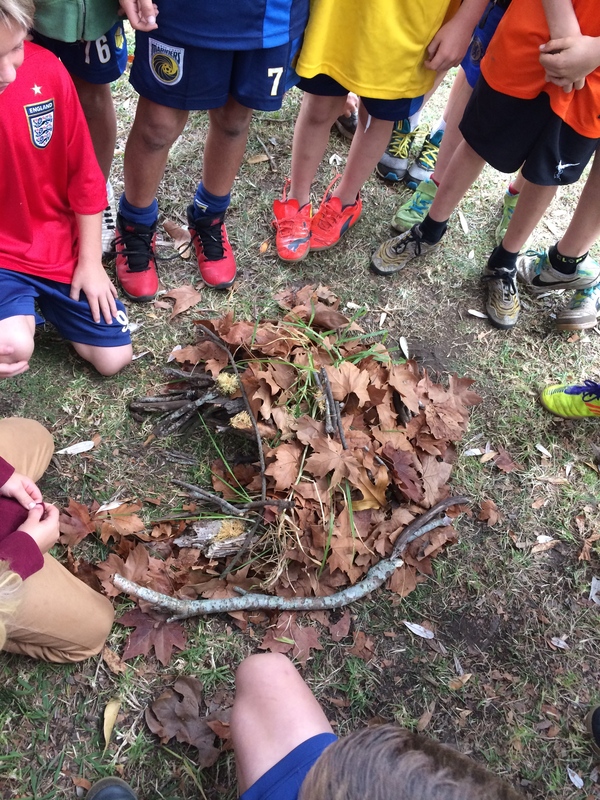 I enjoyed the informal, casual approach to the day, the learning that I witnessed occurring and, perhaps most selfishly, the opportunity to be in a PBL classroom other than my own and see first-hand how this works. Below is the brief and informal presentation I gave to Shane, Karen and Todd in the morning to introduce myself. Basically we just spoke about of some of the reasons for doing PBL, things that should be included when planning a great project, and some outlines of projects I’ve either done or am doing, before jumping straight into teaching and learning. The project that Shane, Karen and their students are working on atm is based around getting kids to design and develop their own ‘Sideshow Alley’ – the kind of thing you see at places like the circus or Luna Park where you get to place ping pong balls into clowns’ mouths and throw darts at balloons. 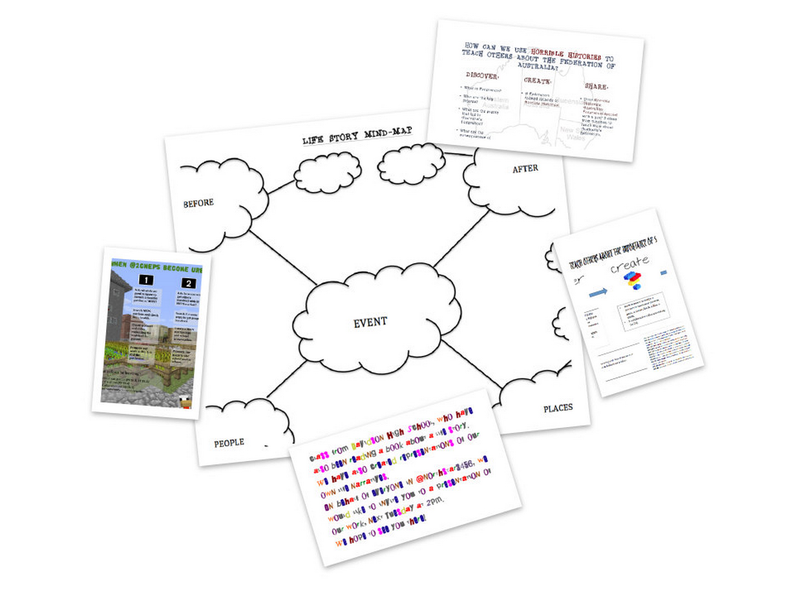 The students, all in stage 3, have to research and design their own versions of these games, build them, before advertising, promoting and hosting their own sideshow alley for the younger kids at the school. I was honestly impressed with what I saw. The enthusiasm, engagement and self-direction of the students was fantastic. If I were to offer any word of constructive criticism for Karen and Shane, it would be to consider how they could make the audience for their project more public. Perhaps by approaching a local operator of a business similar to a sideshow alley, Timezone or something. Anyway, I should probably address my somewhat hyperbolic ‘out-of-body experience’ reference. For me, visiting Shane and Karen’s classroom felt very much akin to that. 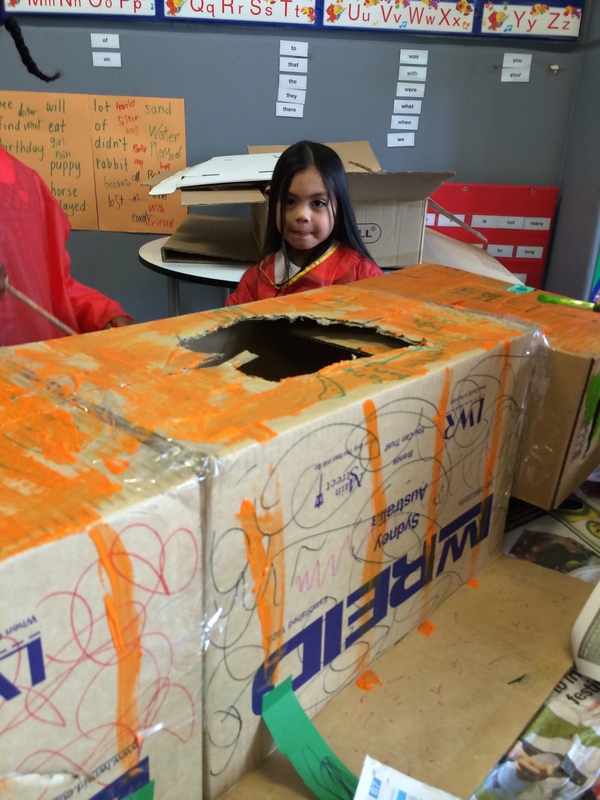 It seems that there are increasingly more educators leaning toward PBL here in Australia, all at different levels of knowledge, expertise and experience. There’s no official ‘training agency’ for PBL and I think that’s the way it should always be. PBL is about inquiry, and the very nature of inquiry is that you don’t have any or many of the answers. So you can never be an expert at inquiry unless you are willing to admit that you know very little. To be an ‘expert’ at PBL, you have to be an expert of the, “I know very little” mindset. Another thing about PBL is that as a teacher you are constantly moving around. There is constant discussion, chatter, collaboration and noise. You’re involved and invested in all of this and, at times, not entirely sure of where all of it is heading. It can sometimes feel quite chaotic and it’s not until the project is finally over that you have some time to thoroughly reflect on how it all went. Today, observing was a release from that. I was able to watch other PBLers in action, to speak to the kids and teachers, to learn with them and from them; to watch, listen, engage with and feel what it’s like to be in a PBL classroom. It was like having a bird’s eye view of my own class – an ‘out-of-body-experience’. 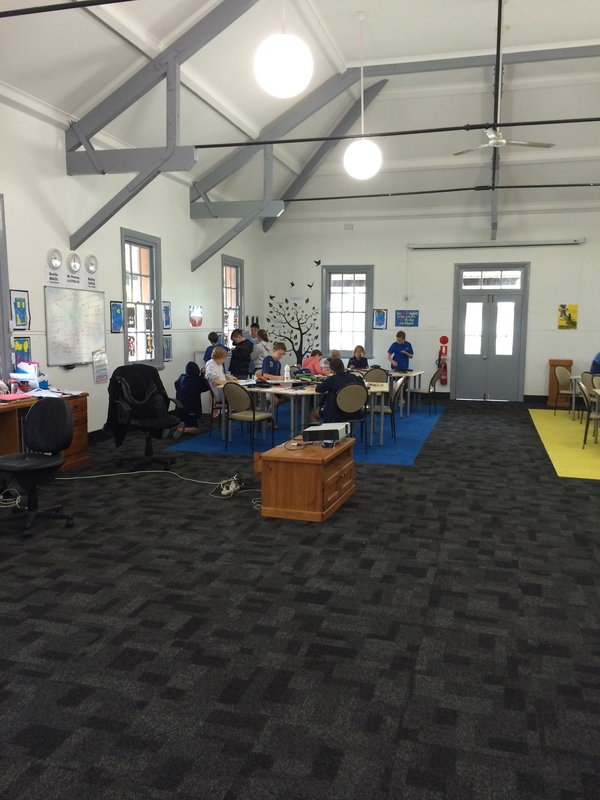 Coming from MEPS, I was also interested in how students were engaging with the open and flexible learning spaces. You can see some photos below. 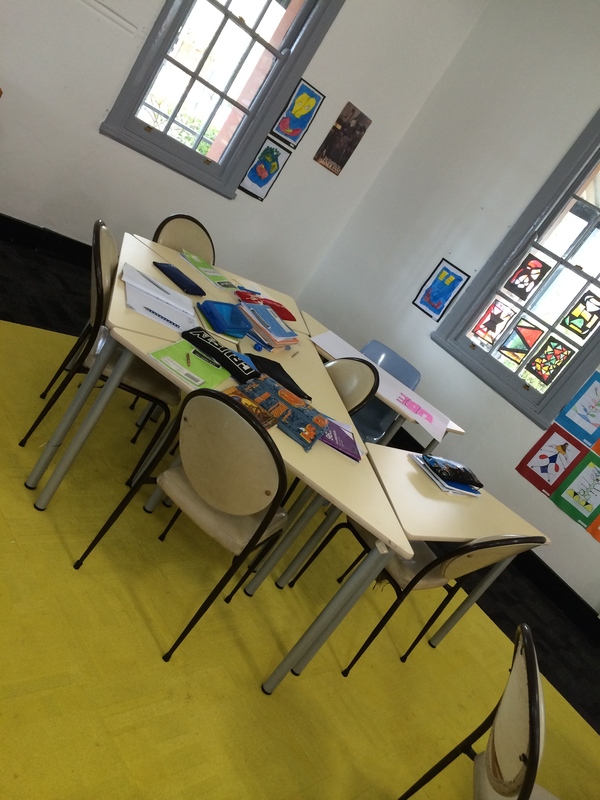 I particularly liked the spaceship table that the students had set up for collaborative learning. Later, I visited the stage 2 classroom. I’d introduced Todd to genius hour earlier in the morning and he was enthusiastic about the concept. So much so that he decided to launch it with his class straight away. After lunch at IFS, students have a bit of ‘quiet time’. Today, this took place in terms of independent, personal interest research – AKA #geniushour, #AdventureTime, or whatever else you want to call it. I walked into a class of learners researching their genius hour projects and this is some of what I saw. I also saw students independently researching spiders, football players, basketball, NRL, Minecraft, fortune-tellers and dinosaurs. Next, students showed me some shelter designs for their ‘Survivors’ project. You can see them below. Take from this what you will. I took a further enthusiasm for learning. Categories: Uncategorized | Tags: Education, Elementary School, learning, PBL, primary School, project, project-learning, School | Permalink. 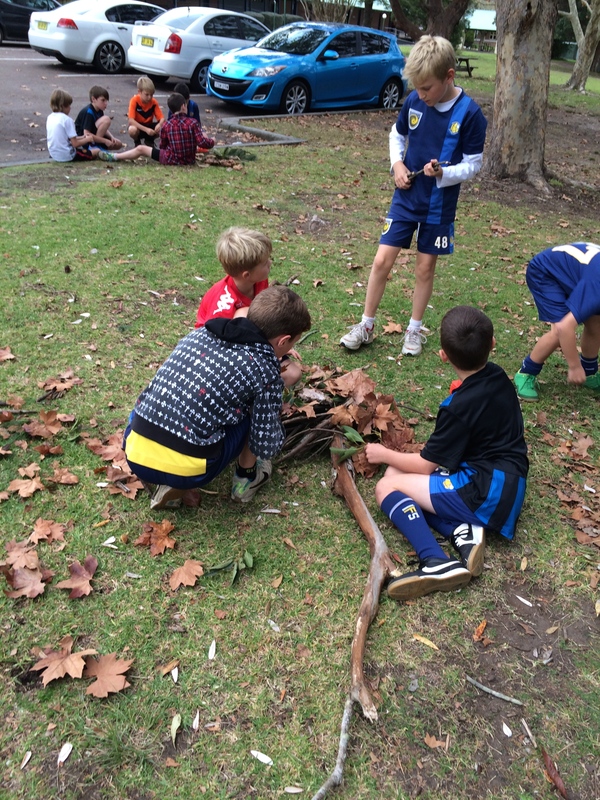 Project-based learning, group work and natural differentiation. 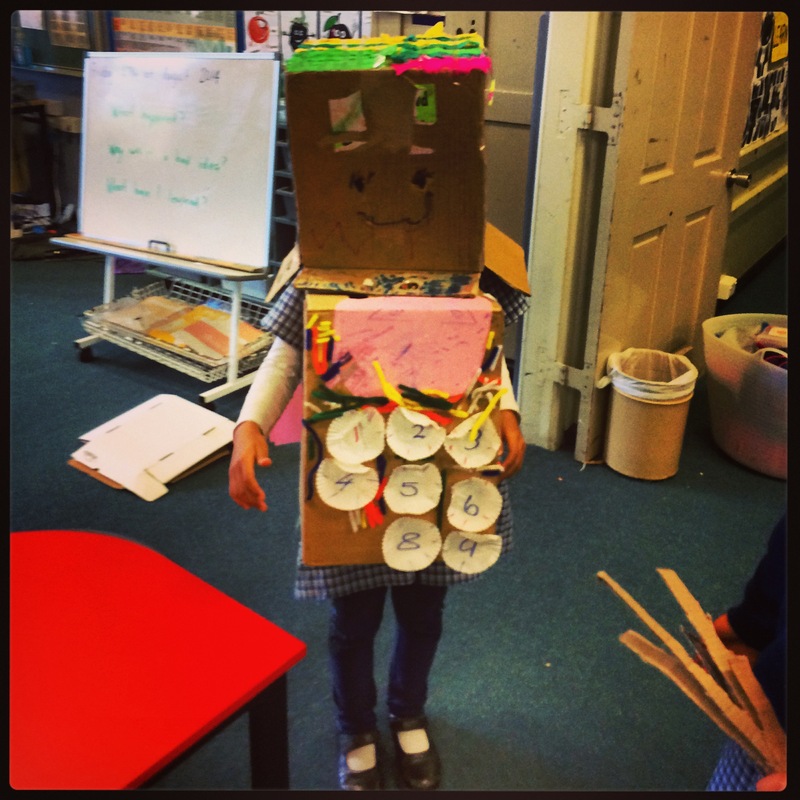 If you’ve ever heard it said that PBL ‘naturally differentiates’ and wondered how, I can give you an example of how this has worked for me with my class of kindergarten and year one students and the project we’re currently winding up. It’s a collaborative research project about Australian animals, with the final ‘product’ to be a bunch of paper slide videos to share with another kindergarten class from Promise Road Elementary over in Indiana, America. We’ve just finished the first of five videos, with the rest to be filmed at different points throughout the upcoming week. So anyway, what of all this group work stuff? I can’t remember where I read it, pretty sure it was in a research article in some educational research journal a while back, but it went a little something like this – for any task to truly be defined as group work, it must involve the completion of something to which all group members must contribute, and something that without any one individual’s contribution, all members of the group will fail to complete the task. Paper slide videos are a fine example of such a task. They typically involve a number of slides in excess of around five, so that each member of the group must create at least one slide. 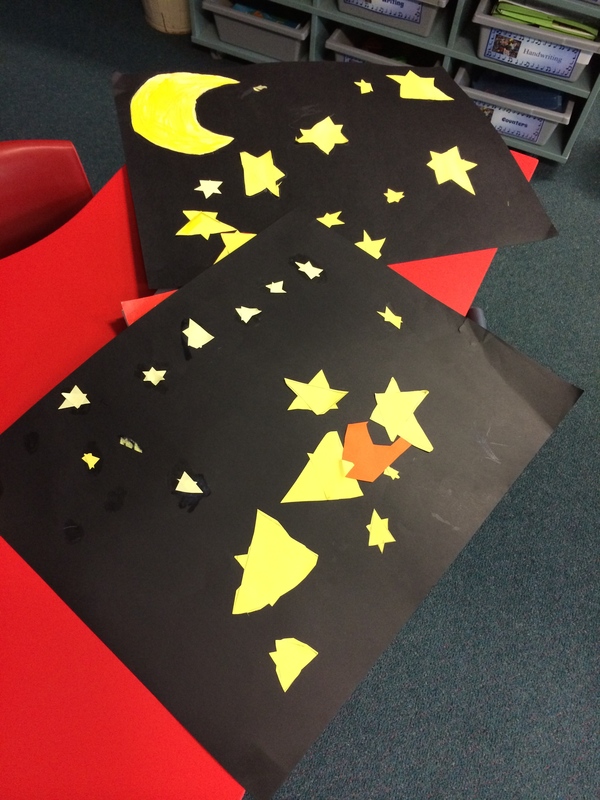 These tasks also require students to decide to commit to one of a number of roles such as paper slider, narrator or camera person. So paper slide videos necessitate collaboration. Without a meaningful contribution from each individual the fate of the whole group is doomed to failure. This necessity for each member to contribute, coupled with the varied nature and number of roles is what lends this task so well to differentiation. Let me explain. 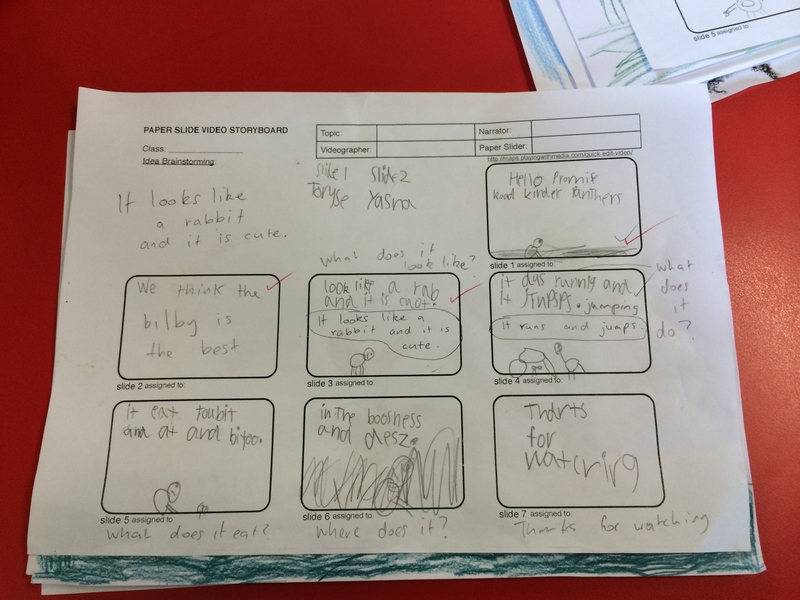 To successfully complete a paper slide video, students need to plan ahead of time what is going to go on each slide so that they know which art to contribute and which lines to write. They also need to decide who is going to narrate each slide, writing out lines based on whatever the topic is that they have been researching. We’ve been using the proforma you can see below, completed by one of my students. Now with students of the age group in my class, not all will be capable of the writing necessary to complete the proforma below, some may not be capable of planning ahead in such a way, either. So it is naturally the case that the more capable students in this area either step up for, or are assigned this role, as was the case on our current project. 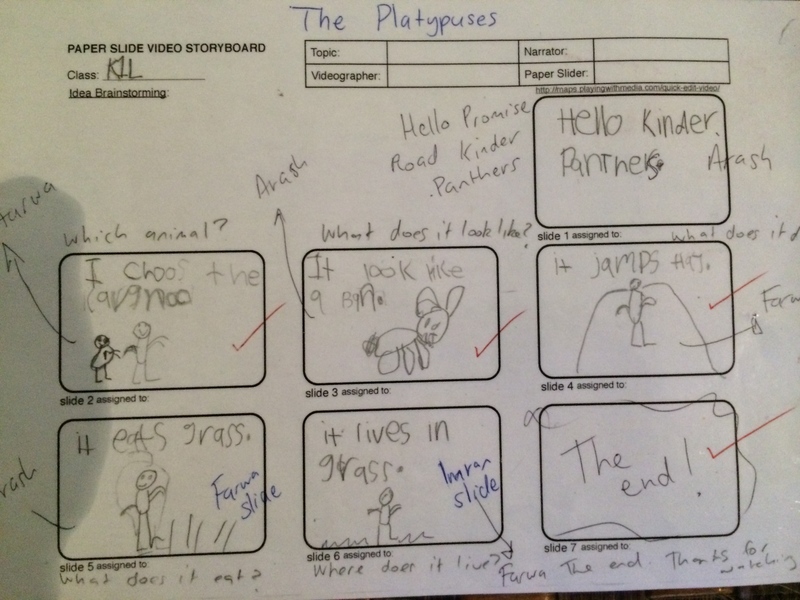 Have a look at all the planning that was done by the leader of The Platypuses. Now whilst not all students are going to be capable of this amount of writing, all students should be able to contribute some artwork for at least one of the slides, some more so than others. Below you can see that one of the students in this group, whilst being unlikely to do much of the talking in the final video, nor much of the writing in the planning or scripting, was able to contribute a whopping four out of seven slides worth of artwork! The two kindy kids in the group contributed one slide each, you can see them below. With all of the planning done by the student who completed the proforma, he didn’t get around to creating a slide, so he’ll be completing the opening slide at some point before his group can go on to film their video. 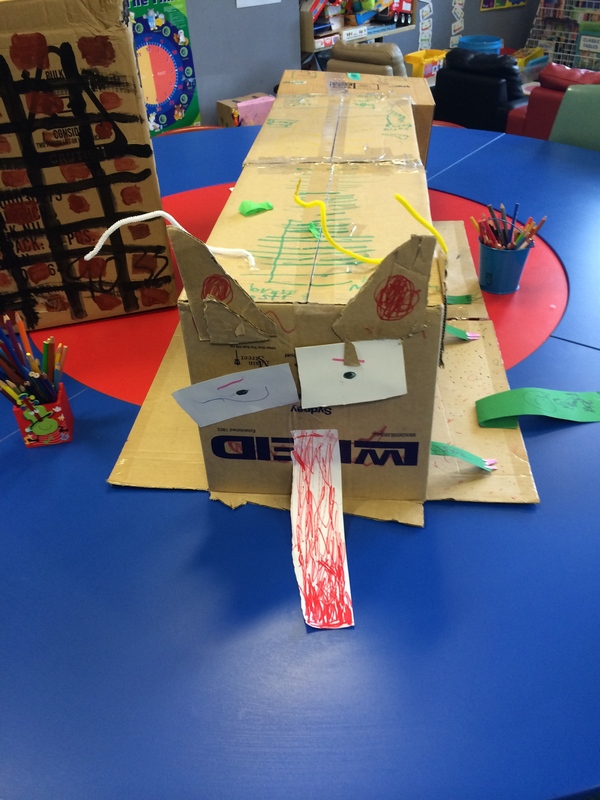 When it does come time to film, students will need to commit to roles that provide them a suitable challenge and that contributes adequately to the overall group task. Not all students will be comfortable or capable of speaking for an extended period of time on film, so they may be given only one slide to speak over. Others will be quite comfortable speaking, so may be given a number of slides to speak over. Someone will also need to be the camera person whilst another will need to be the paper slider. All of these different roles provide a range of differentiated opportunities for students to contribute in a meaningful way to the project and feel successful and comfortable with what they are doing at school. Plus it’s fun. Whilst a paper slide video can be made by students outside of a PBL classroom, the fact that I’ve designed this project around a Driving Question and have been lucky enough to find a public audience has really driven the relevance and motivation for students to complete this task. I also believe that it has added to the quality of the end result. I can’t wait to get the rest of the videos filmed and uploaded so that we can share them with Promise Road Kinder Panthers. I know also that my students are gonna be proud of all their hard work, learning and collaboration. PBL win! Categories: Uncategorized | Tags: Education, elementary education, Elementary School, learning, paper slide video, PBL, primary education, project-based learning, project-learning, School, teaching, technology in education | Permalink. 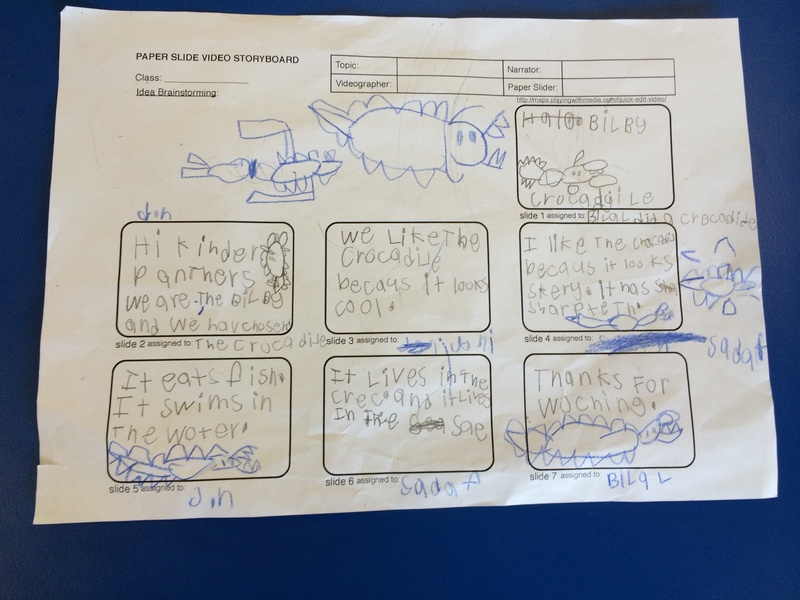 Kindy PBL: paper slide videos. This year I have been fortunate enough to be given a temporary block with my very own class of kindergarten and year one students. For this term I have designed a project around the weird and wonderful creatures that are native to Australia. It’s been a joy to implement and watch as my students have been engaged and learning about some of the creatures we have here in our country. 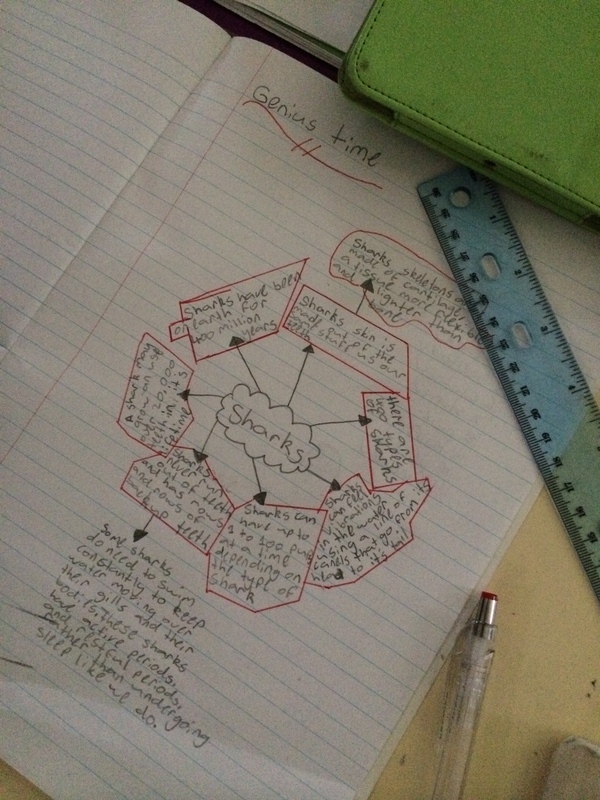 They have been researching with stage 3 students, using a range of paper and web-based texts, compiling their information and are now at the stage where they can put all of their learning together to make an informative video for some kindergarten students in the US who know very little about Australia in general, but much less about the creatures we have over here. If you look at the video below, you’ll see what I mean. Polar bears! #Lulz, #adorable. Anyway, we’ve been working really hard to get all of the videos planned, designed and created so that we can upload them all before the end of term so that the Promise Road Kinder Panthers can view them when they get back from spring break. 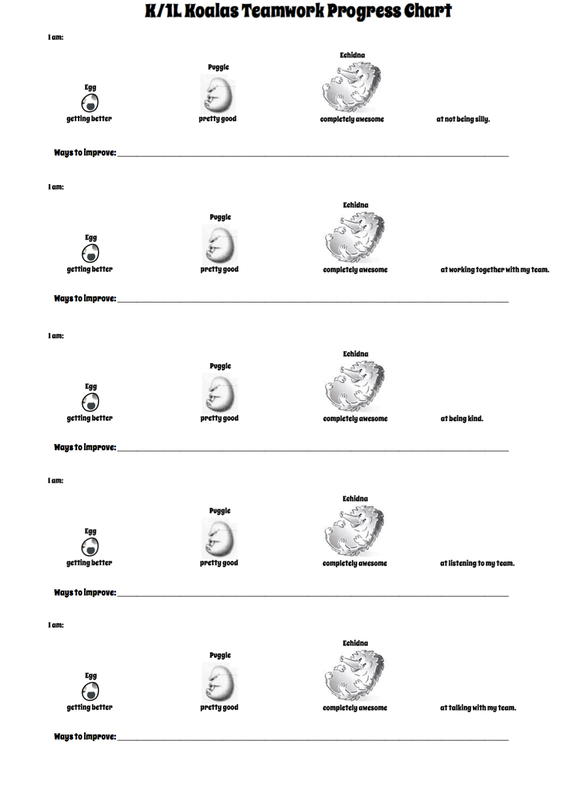 We’ve used this rubric, and whilst the language of the instructions is probably not suitable for children as my students, I didn’t bother changing it as the basic concept is all they need to understand. Put down your plans for each slide in the boxes provided, write down what is going to be said and who is going to say it. In future, I’d probably simplify the language but I don’t think it’s a massive issue as all of my groups have managed to plan their videos. You can see some examples of the planning below. 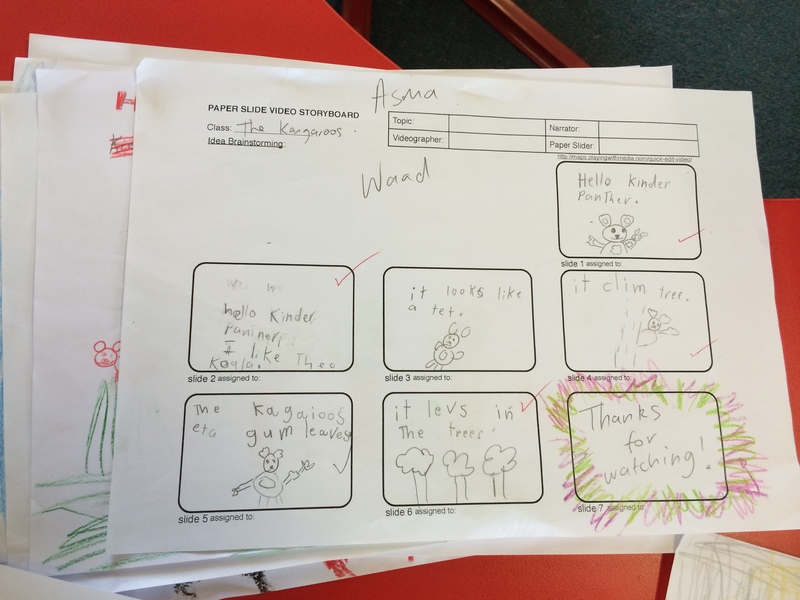 It’s actually been quite good as a formative assessment tool to see how much students have learned about the content, as well as for basic reading, writing and spelling skills. As is always the case with project-based learning, I’ve found that some groups are progressing through the project more quickly than others. So as it stands at the moment, I have some groups who have yet to finish their slides, some who are practising for their video, and one group who has managed to finish their video. You can see it below, I think they did really well! I love how you can hear them collaborating and whispering to each other as they remind each other of who is the next narrator! To make things fair and to ensure that everybody gets a role, I’ve made sure that the kindy kiddies in each group have been assigned at least one slide to illustrate and narrate. In this video there are two kindy kids in the group. One kindergarten kid narrates the opening slide and the slide with the information about what bilbies eat, whilst the other (quietly) narrates the final slide, followed by a repeat farewell from the whole class! The rest of the slides are narrated by year ones. 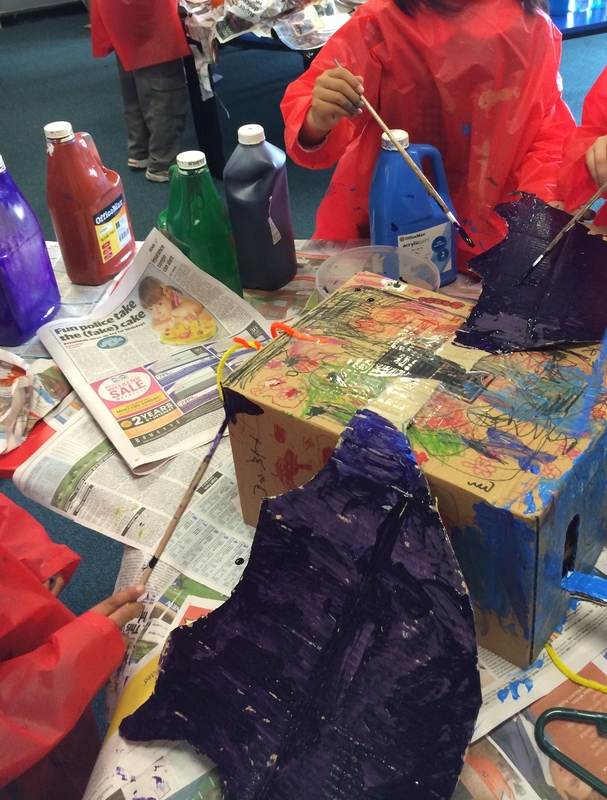 So anyway, there you have it, children can engage in project based learning as early as kindergarten. And they can enjoy it! Categories: Uncategorized | Tags: elementary education, learning, PBL, primary education, primary School, project-based learning, project-learning, teaching | Permalink. So we’re all eggs? Collaborative levelling up, @K1MEPS stylez. Last year I had a go at using the K-2 teamwork rubric, generously provided by BIE, with the class I was working with at the time. I wrote about it, you can read it here. Anyway, after my experiences working with the rubric there were a few things that I thought I might like to change a little to make it more effective for my class. Changing some of the icons to make them a bit more visually appealing, relevant and perhaps more personalised for any of my future classes. Don’t get me wrong, the icons on the BIE rubric are fine, but as with anything, it can always be better adapted to better suit individual contexts. If you read the post I linked to earlier, you would have learned that one of students had asked, “Why is the man shouting at the lady?” when we were discussing the ‘share my ideas’ icon, bless! 1. We’ve been working for a little while on a project about Australian animals so I knew these images would be relevant to my students. 2. 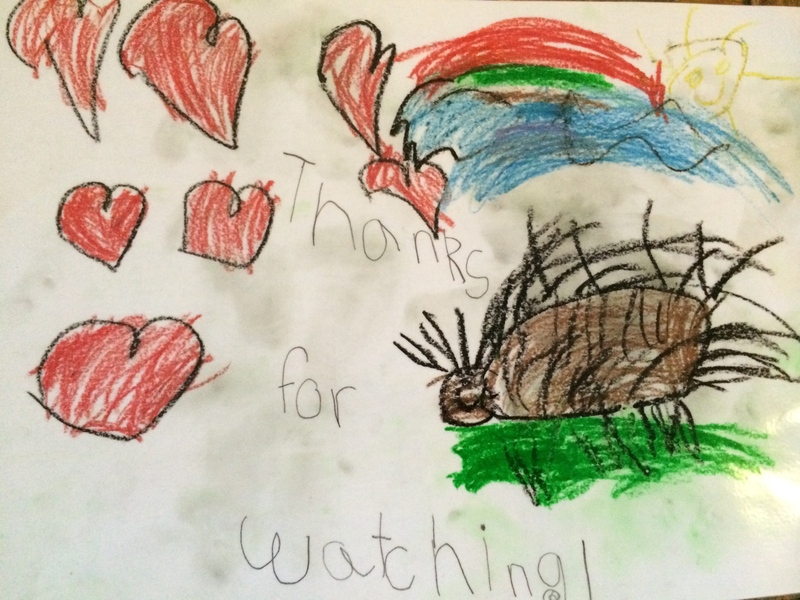 We recently learned that a baby echidna is called a ‘puggle’ and I couldn’t resist incorporating that word into our regular classroom discourse into whatever way possible. For those of you who don’t know (as I didn’t until a week or so ago) ‘puggle’ is the name given to a baby monotreme (echidna or platypus). 3. The different stages in the life cycles of monotremes show quite visually the levelling up process that I’m hoping to occur as students get better at collaborating with their peers. It goes: egg < puggle < echidna. My students are very young and respond well to visual cues, so I thought this would work quite well. From experience, last time I also thought it would be helpful to add a space to put some comments and suggestions on how to get better. Last time we ended up flipping over to the back of the rubric and using that space for comments. However this time I added some space under each of the criteria to put some goals for the next time students work in teams. It’s not much but I think it will help. One of the other changes I decided to make was adjusting the criteria for what constitutes a good team member. Again, it’s not that any of the criteria on BIE’s rubric are in any way deficient. it’s just that I think that any specified criteria would be more powerful, effective and relevant to students if they came up with the criteria themselves. My theory is that students are more likely to take ownership over any criteria and be more committed to working toward it if they themselves had come up with it, rather than having simply been given it at the beginning of a task or project and expected to live up to it. So that’s what we did. So at the end of today we went over the criteria again. I explained that we’ll be referring back to it regularly and that as we all get better at teamwork we’ll get greater team privileges and responsibilities. 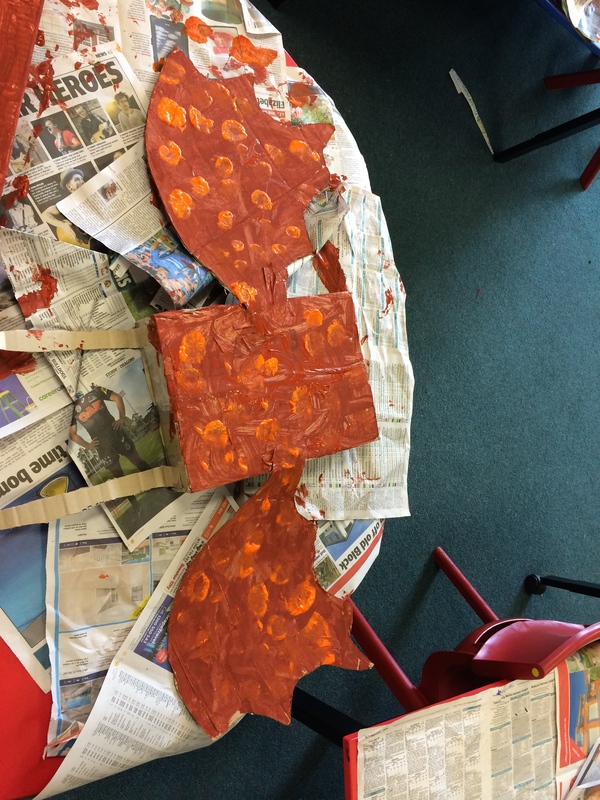 We discussed the progress from egg through to echidna. I think it was received pretty well. You can see the current version of the rubric below. I’m looking forward to us all becoming collaboration echidnas, with our epic spikes of teamworky goodness! Categories: Uncategorized | Tags: collaboration, Education, elementary education, PBL, peer assessment, primary education, primary School, project-based learning, project-learning, rubric, School, self-assessment | Permalink. 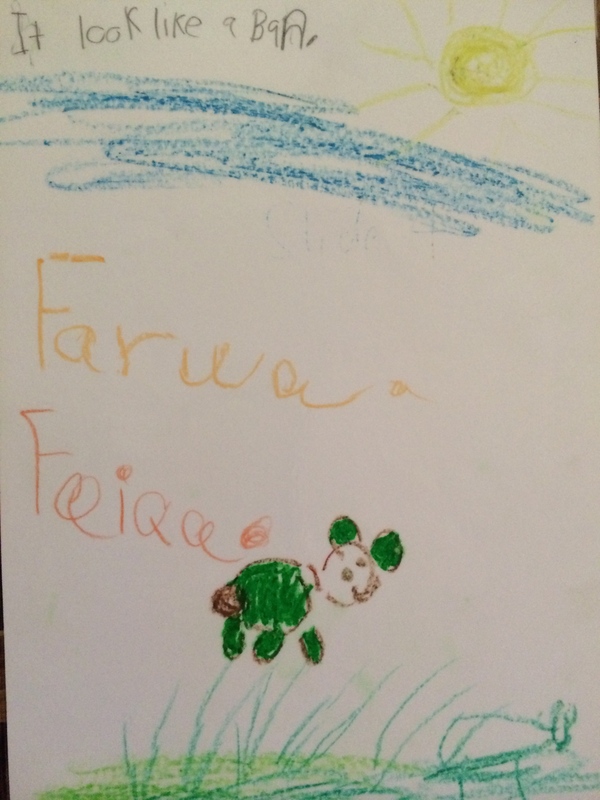 If you’ve already read the title of this post, I retrospectively apologise. If you haven’t already read the title, I firstly question why you are reading this post without having previously read the title and apologise in advance for use of the ‘edu‘ prefix on what was already a perfectly legitimate word with independent meaning to begin with. The reason I make these apologies is due to the fact that it’s become a bit of a laugh in our household that some in education (or at least in the Twittersphere) seem to chuck the edu prefix onto pre-established words in the hope that this somehow makes the use of these words more relevant and meaningful when it comes to education. Beyond that, I make no further apology, and if you’re still interested in reading, this post is a personal reflection on what, for me, has been an awesome year of learning. 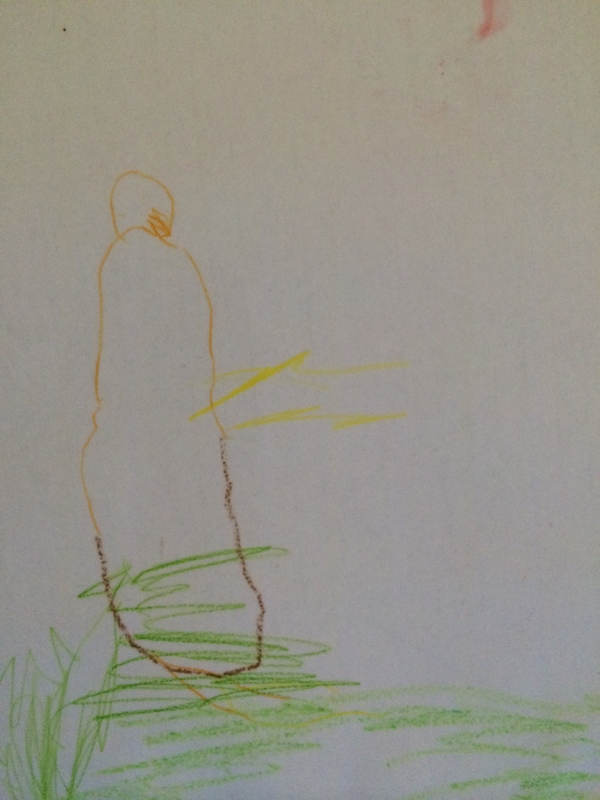 Oh, wait – one more apology – this is a completely self-indulgent reflection on my own personal experiences in education and as such there will be minimal backslaps or appeals to a wider audience, etc. So if you’re still down for it, please feel free to read on. So last year, frustrated with how things were going (or not really going) with a research degree in psychology, and following a longstanding passion for and interest in both education and psychology, I decided to apply for a place in the Master of Teaching (Primary) degree at the University of Sydney. It’s had its ups and downs, like anything in life, but I can honestly say that embarking on the journey to becoming a teacher – a journey which I consider to be perpetual – has been one of my best life decisions. There are somewhat obvious reasons for this, such as my aforementioned passions for psychology and, in particular, developmental psychology; but those are of a lifelong nature and not specific to 2013 so I’m gonna leave those alone and proceed to bang on about my MTeach experiences in 2013. In May I travelled up to North Star, NSW to complete a month-long practicum at North Star Public School with Michael Sky and The Phenomenal 15 – a class of 15 students in years 3, 4, 5 & 6. This was a fantastic experience for so many reasons. Firstly, I was away from my family for the whole month. Now this was not good in and of itself as, of course, I love my family deeply and being away from my wife and kids for a month was obviously difficult for all of us. However, being away from home for this period meant that I was able to focus my efforts more-or-less entirely on becoming a better teacher, in the absence of all of the constant business that being a family man entails. I’m very grateful to Bianca for taking on sole responsibility for the children whilst I was away and I’m sure I’ll make it up to her at some point, if I haven’t already. A pair of Doc Martens, perhaps? Tickets to see something cool at the theatre? I’m open to suggestions. Another thing that was cool about going to North Star was the necessity whilst I was there to try to cater daily as best I could for the needs and abilities of learners in all of the year groups across stages 2 & 3. North Star Public School is a small school with only around 30 enrolled students, and as a result there are only 2 classes at the school; a K-2 class and a class for students in years 3, 4, 5 & 6 – The Phenomenal 15. Now Michael does a fantastic job in my personal opinion and for the most part I took on his advice and more or less followed his routines whilst planning and implementing lessons as best I could, trying to make them as interesting and engaging as possible. Where I think this really went well was with the life stories PBL project we undertook with The Phenomenal 15 while I was there. I documented as much of Project Awesome as I could while I was up at North Star and wrote some reflections when I returned to Sydney, so I think it’s documented well enough, and I won’t go over it all again here. I will say, however, that I’m massively grateful to Michael for allowing me the opportunity to give PBL a go whilst I was at North Star, it gave me an invaluable chance to gain some experience with this pedagogy and some insight into planning and implementing sequenced, connected and sustained learning experiences for students – as opposed to disconnected lessons. 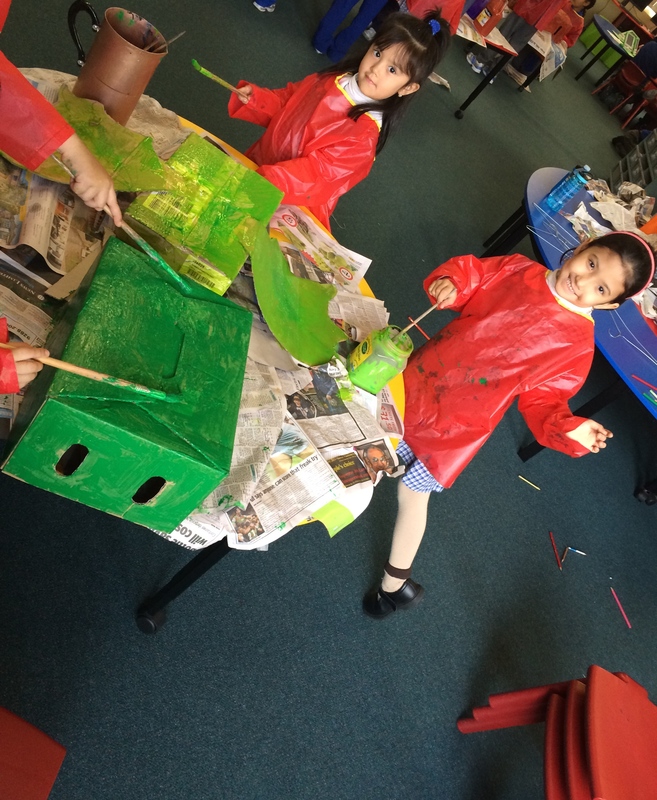 It also helped with the projects which were to follow at Merrylands East Public School – another highlight for 2013! 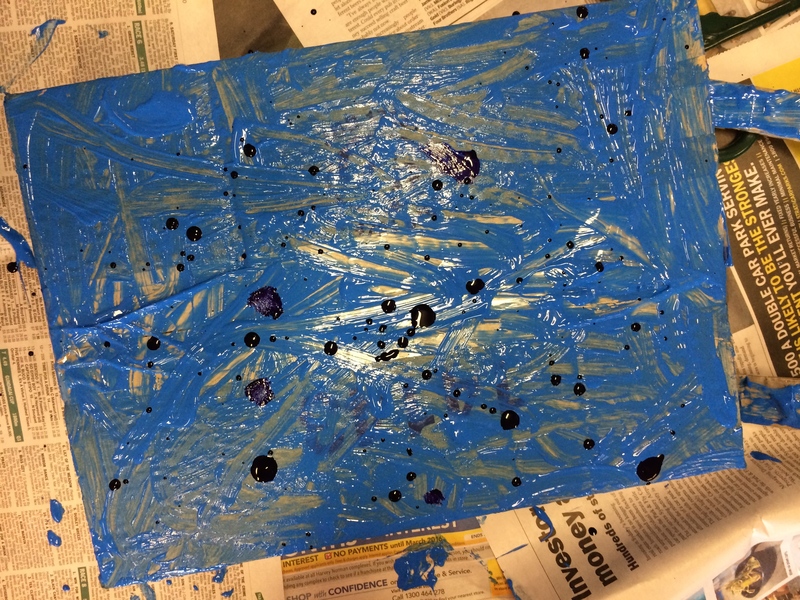 Briefly, another thing I will say about Project Awesome is that I found that PBL allowed for differentiation to occur quite naturally, particularly by allowing students voice and choice in the products they were creating. 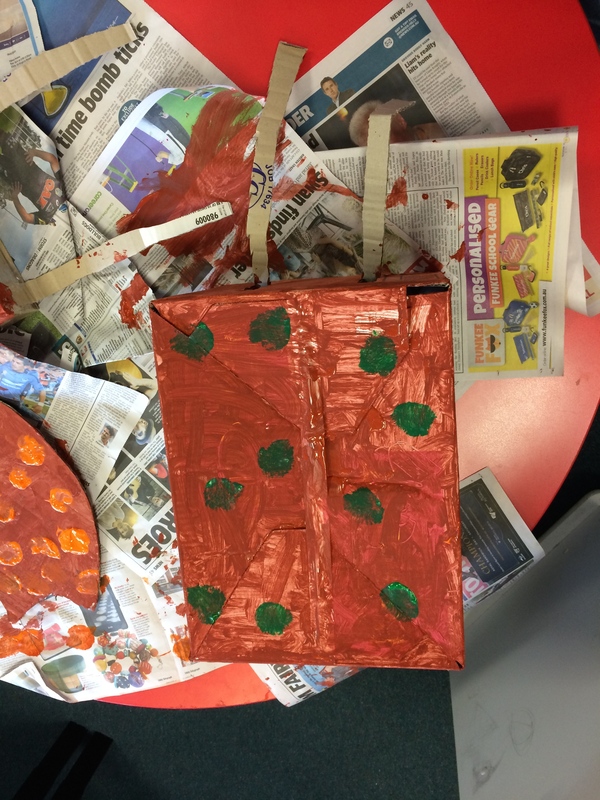 Some students created games, others artworks, whilst others created videos using moviemaker and screencasts of Minecraft builds using QuickTime. I feel that this range of products catered for students’ interests and abilities whilst allowing Michael and I to adequately support them as they completed the challenge of creating their products. So for terms 3 & 4 of this school year I spent much of my time at Merrylands East Public School. I didn’t wind up here by accident and, as with my prac at North Star, I became interested in working at MEPS through connecting with some of the people who work there via social media. So earlier in the year I asked John Goh if he’d be willing to let me complete my MTeach internship at MEPS and he said yes – and what an epic experience it was. I knew that MEPS was going to be a cool school, that’s why I worked hard to get the chance to go there. There were a few issues with the administration team at USyd that had to be sorted out, and some red tape and miscommunication from the uni nearly stopped me from being able to get to either North Star or MEPS, but anyway that’s a long and boring story. MEPS is quite a distance from my home and as the school has changed its teaching hours to 8:00 – 1:15, it meant that I had to get up quite early to make it to school on time. These factors (cool school, long way from home, early start to the day) made it a logistically and logically wise decision for me to temporarily enrol my two boys at the school for the time that I was there. We only had 1 family car at the time and it didn’t make sense to send the kids to school with Bianca to sit in her staff room from 6 – 9am doing nothing, and as I said, I knew MEPS would be cool so they came with me. And they loved it. So anyway, here’s what happened. We bagged Brenden from Community Greening. Brenden is a horticulturalist who does a lot of work with schools around Sydney helping design, revamp and develop their gardens. The kids from 2C really enjoyed Brenden’s involvement in the project and it drove their motivation to continue to maintain and care for the garden whilst I was there. If you’re ever involved with any kind of authentic project at school, I’d highly recommend getting an expert involved to give students advice, an audience and community connectedness to their work. For the farmers’ market project I designed a website using Weebly which we used for a whole bunch of stuff throughout the project. Much of this was based around class activities where students would draft comments to later post via iPads, laptops or PCs in class. However, I did encourage students to go on and comment whenever they wanted to from home. I moderated these comments and would get a notification on my phone whenever a student’s one popped up, asking for me to approve the comment. I found that through moderating these comments I was able to not only assess how students were going in relation to literacy and give feedback and help accordingly, but I was also able to see through their conversations when we might need to have a class conversation on digital citizenship and internet privacy. For instance, I noticed at one point that one of the students had posted a reply to one of the other students and had perhaps not considered what impact this comment might have on the other student, so I told her that I couldn’t approve the comment and we then had a class discussion on appropriate Internet etiquette. As part of the MTeach students have to undertake an action research project during their internship. As part of the research we had to collect and analyse both quantitative and qualitative data on our topic of interest. 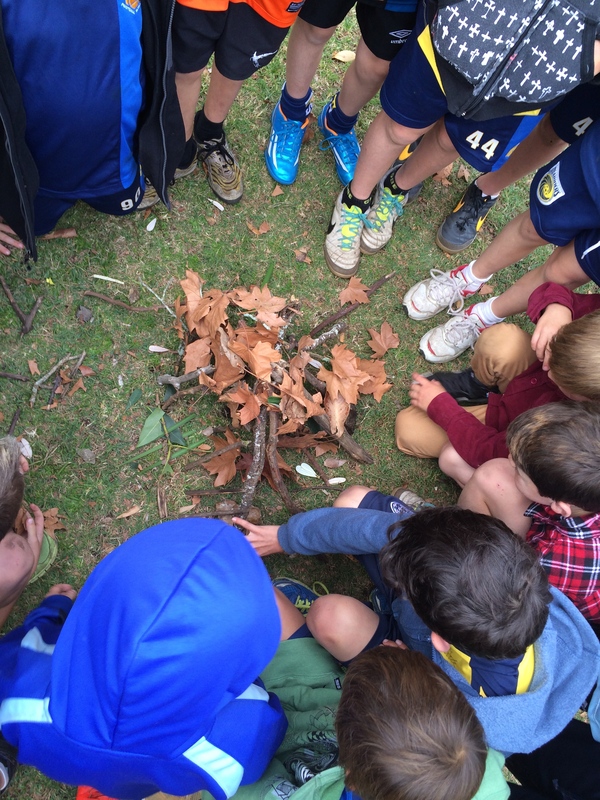 Given the importance of the general capabilities in the Australian Curriculum, in particular personal and social capability and the fact that 21st century skills (such as communication and collaboration) are fundamental to PBL (one of the eight essential elements), I decided to focus my action research on getting students to self-assess how they were going with their teamwork. We had students in 2C regularly complete the teamwork rubric from BIE and this constituted the quantitaive (percentage of certain responses) and much of the qualitative data (depth of reflection on rubric comments) of the action research project. I collected additional qualitative data via comments on the project Weebly and analysed how much of a collaborative focus these comments took over time. At the beginning of the project students predominately reported via rubric (52% 0f responses) that they ‘almost always’ helped their teammates, or almost always listened to their teammates. In contrast, very little student responses declared that they were ‘still learning’ (4% of responses) any of these behaviours. Over the course of the project the percentage of ‘almost always’ responses dropped to around 34% whilst the ‘still learning’ responses increased to around 16% of responses. I took this as evidence that kids in 2C were starting to think more honestly about their collaboration and were becoming less likely to respond by completing the rubric in order to show what might be considered an ‘ideal’ response and beginning to show how they actually thought they were going. The qualitative data showed a similar pattern whereby students’ rubric reflections became more detailed and elaborate, explaining more about how they were thought they were going, giving specific details about what they were doing in class at certain times as examples of how they were getting better at collaborating. The Weebly comments also showed that students were increasingly beginning to use more collaborative language in their comments, sometimes even mentioning the rubric specifically. I’ll chuck my final report up on my files page later so you can flick through it if interested. Teamwork was a strong focus for me this year and ties in well with my later experiences working with year 6 at Merrylands East. So after finishing my internship with year 2 I was fortunate enough to be given the opportunity to work with year 6 for five weeks on a temporary block whilst one of year 6 teachers was away on long-service leave. Now this was a completely new experience for me as the year 6 cohort at MEPS is taught together in a massive, open learning space by a team of three awesome teachers. Whilst there I was asked to cover the history and science content that would usually be covered by @holidaydereamer_, the teacher whom I was relieving. I can’t say that I did so well on the science side of things, although we did have a few interesting lessons, but I am pretty chuffed with how the history went down. Whilst working with year 6 at MEPS I was asked to have students learn about the Federation of Australia. We did this by creating an episode of Horrible Histories based on the events, people and places involved in this historical event. I had so much fun with this project and I’m pretty sure that most of the students did too! Some of the scenes that students created for the final episode were so creative, showing how well they understood what they’d been learning and how they were able to adapt it to create skits which I think are hilarious. My main lessons from my experiences with year 6 and Horrible Histories again quite fittingly are focussed on teamwork and collaboration. I’ve said this in a previous post but I’ll say it again anyway. The groups that were set up for this project had about 6 -7 students; I think this is too many. I think this allows for some students to take on most of the work whilst others may tend to drift away a bit and disengage from the project. I think having smaller groups would provide opportunity to establish roles, contracts, etc., giving each student in the group responsibility and accountability. With a large class like the cohort at MEPS this would mean that there are more groups to manage but I think that each group would create a better final product in the end. Also, I think part of my problem was that I used the pre-established class groups from the beginning of the project as I didn’t know the students and anything about the group dynamics. It makes sense as I figured the groups had worked together before so they should work together well again – I guess this is really a matter of knowing the students and how they learn. In all I think the project went well, I guess what I’m saying is that in future I’d get to know the students as best as possible to begin with before assigning groups, whilst at the same time ensuring groups consisted of around 3 -5 students. As I mentioned before, this year’s cohort at MEPS was taught by a team of 3 teachers. I’m not sure that team teaching is everyone’s cup of tea but I actually really enjoyed it. Whilst I was with year 6, Solange and Lisa, we also had Jo working with us on her final prac at UWS. This meant that there were actually 4 teachers working together and collaborating to help the students learn! I found it worked really well. The general routine was that Lisa would take the kids for the morning session and we’d be doing something mathematically related, either Jo or I would run something for some time after this, up until recess or a little while after, then Solange would return and we’d do something literacy related and towards the end of the day we’d work at getting students to tie up the loose ends on any other project stuff they were doing or something similar. Of course, it wasn’t always as routined as that and things happened all over the place to throw us off kilt – mostly John walking through with a whole bunch of random teachers and principals from all over the shop, lol. What I learned from all of this team teaching stuff was the importance of being flexible and adaptable. When there are many teachers working together, with students working on multiple projects – I had Horrible Histories, Jo was organising a poetry slam, students were working on blogs, we had individual interest projects happening on Friday and elsewhere (Adventure Time [Genius Hour]), as well as all of the regular mayhem of school – you need to be able to work around what everybody else is doing with the time you have available. This is a bit of a challenge, but a challenge that I found enjoyable and rewarding. I’m not sure exactly why that is; it’s no doubt due to the awesome team at MEPS but also, I think, in some degree down to the fact that I’m pretty easy going most of the time and have no massive drive for control. Whatever it is, I’m definitely open to giving collaborative teaching a go in future. So there you have it. Those were some of my highlights of what I consider to be a fantastic year of learning. I haven’t even mentioned #PLSM13 and the massive journey involved with that in 2013, perhaps I’ll reflect on that later. I also didn’t get into my experiences as a ‘freelance’ (casual, #lulz) teacher. It feels good to be going into 2014 with my teaching qualifications and I look forward to whatever happens next. It’s difficult to find full time work out there, and whilst I’m happy to work casually for the time being, I’m really looking forward to getting my own class and doing epic things. Categories: Uncategorized | Tags: Education, elementary, elementary education, Elementary School, K-6, learning, PBL, primary education, project-based learning, project-learning, School, teaching | Permalink.